English has probably not imported as many words and phrases from German as it has from French, but quite a few have made the journey; kindergarten, schadenfreude, flak, zeitgeist, vorsprung durch technik. One German phrase that we haven’t adopted is “Gesundes Volksempfinden”. It might be a mouthful, but it is painfully appropriate for the current frenzy surrounding Brexit. It literally means the healthy feeling (or sentiment) of the people. A more useful translation would be the will of the people. Gesundes Volksempfinden is a highly loaded and sensitive phrase and would not be used lightly by German papers. It is a Nazi legal concept. When the Nazis came to power they had a problem. They had inherited a working legal system. Judges tried cases according to the law and could acquit, or find in favour of, the wrong people; Jews, Social Democrats, dissidents. Sure, there was an ample supply of uniformed thugs willing to break windows, beat up undesirables, and even kill them, but that was a tad vulgar. It was hardly an efficient way to run a modern state and earn a nod of approval from the 1930s Daily Mail. The problem was resolved simply. First, in 1934 the Nazi regime issued a decree that civil claims should be settled according to Gesundes Volksempfinden, the healthy feeling of the people, regardless of what the law actually stated. In 1935 the German Criminal Code was amended in the same way. Where the written law was in conflict with the “healthy feeling of the people” (as interpreted by the Nazis, and ultimately Hitler himself) judges were required to convict, regardless of what the statute actually said, even if the law did not cover the actions of the accused. The phrase was picked up as “the healthy will of the people” by an approving Oswald Mosley, the British fascist leader, and poster boy of the Daily Mail. After the war US Army legal officers took a close look at how the Nazi legal system had operated. Their report described a case that illustrated how Gesundes Volksempfinden worked. In the days when it was still possible for Jews to seek redress through the courts a group of Jews had contested a decision that stopped them receiving rations. They won, only for the decision to be overturned for the following reason. Even if the judge was convinced that the Food Office had arrived at an incorrect judgment he should have chosen a form for his ruling which avoided at all costs harming the prestige of the Food Office and thus putting the Jew expressly in the right toward it. This is reminiscent of a famous English legal case I will come to in a moment. But first I will turn to the press hysteria that followed the decision of the High Court in London finding that Article 50, starting the UK’s exit from the EU, could not be initiated without the approval of Parliament. The central reason for the court’s decision was that the Prime Minister cannot use the Royal Prerogative to remove our rights. Only Parliament can do that. This point was widely ignored in the right wing press, which instead accused the judges of defying the will of the people and taking a pro-EU, anti-Brexit, political stance. The Daily Express indulged in laughably hysterical hyperbole. 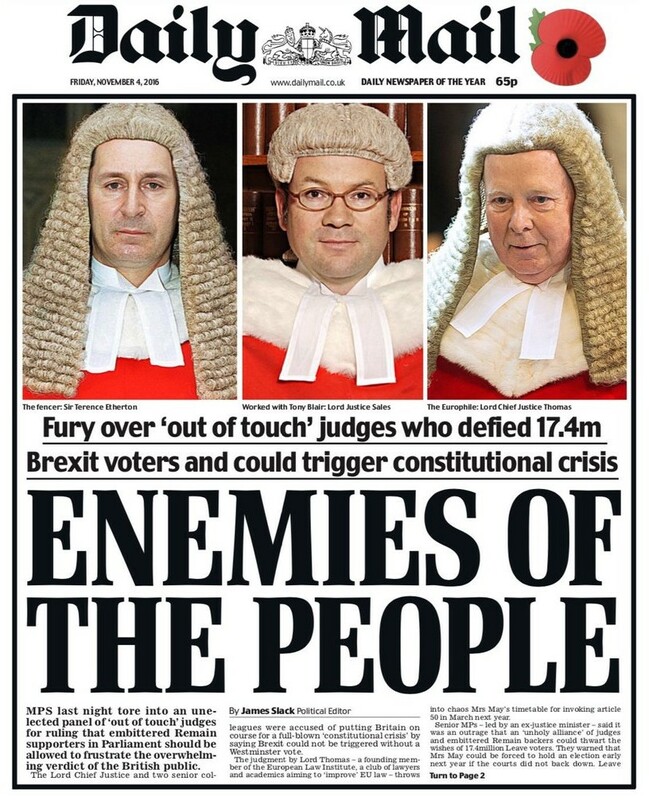 The Daily Telegraph was rather more subtle, printing photographs of the three judges with a sinister blue filter, under the headline “The judges versus the people”. It was the Daily Mail, however, which launched the most offensive attack on the judges. The headline was “Enemies of the people” and invited us to disapprove of utterly irrelevant and harmless details about their private lives. 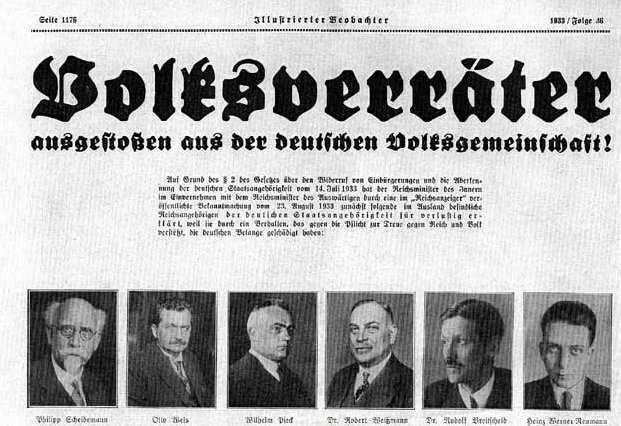 The front page was compared with an edition of the Nazi paper, the Illustrierter Beobachter, depicting a group of Social Democrats as “Traitors to the people” and reporting that they had been deprived of their German citizenship. They were usually identified incorrectly as judges on Twitter but there was a valid underlying point; opposition to “the people” had put them beyond the pale, beyond the law. In an editorial the Mail called the judges “an out of touch clique” who were guilty of “an outrageous betrayal of democracy”. The Mail then went on to make an intriguing argument, that deserves more discussion. On a blinkered reading of statutes… it is possible to argue that the Government lacks the authority to trigger Brexit without the go-ahead of the Lords and Commons. But from every other viewpoint, the ruling flies in the face of justice and common sense. Wouldn’t any judge of real stature (the late Lord Denning springs to mind) have picked a way through the dust-encrusted legal textbooks to see the wood for the trees and come down on the side of reason? … The High Court yesterday betrayed common sense and the people. So the Daily Mail grudgingly conceded that the ruling might have been correct in law, but that it offended the will of the people. They argued this even though the judges explicitly stated that the law allows the courts to recognise the will of the people only as it is reflected in laws passed by Parliament. Nevertheless, the Mail used language, and an argument, that is entirely consistent with the Nazi ruling I referred to above. To hammer home their point they invoked Lord Denning, who acquired an unfortunate reputation for being too inclined to favour the executive arm of the state over the liberties of the individual. He is now chiefly remembered, by non-lawyers, for his remarkable conduct in the case of McIlkenny v. Chief Constable of the West Midlands in 1980. This was a case brought by the Birmingham Six, alleging police brutality at the time of their arrests in 1974. Denning dismissed the case. Just consider the course of events if this action were to go to trial… If the six men win, it will mean that the police were guilty of perjury, that they were guilty of violence and threats, that the confessions were involuntary and were improperly admitted in evidence: and that the convictions were erroneous. That would mean that the Home Secretary would have either to recommend they be pardoned or he would have to remit the case to the Court of Appeal… This is such an appalling vista that every sensible person in the land would say: it cannot be right that these actions should go any further. They should be struck out. All these dreadful allegations about police misconduct turned out to be true, but they could not even be considered by the court. In 1980 Lord Denning was very much in touch with the public mood. Following a succession of terrorist attacks there was an ugly anti-Irish mood in Britain. The case of the Birmingham Six was just one of a series of miscarriages of justice in which the state acted illegally, but in line with the will of the people. This is the justice that the Daily Mail is calling for; their argument and that of Lord Denning is exactly the same in principle as that of the Nazi judgment on food rations for Jews. Call it the will of the people, or Gesundes Volksempfinden, it is the same thing. What sets free and prosperous societies apart is reliance on the rule of law. Without that nobody can be confident about anything. No-one has an incentive to work and build for the future. State power is arbitrary. People keep their heads down and don’t take chances. When Mikhail Gorbachev was planning the reform of the USSR his adviser Alexander Yakovlev wrote to him. For a thousand years we have been ruled by people and not by laws… What we are talking about is not the dismantling of Stalinism but a replacement of a 1,000-year old model of statehood. Throughout the 1990s Russia struggled to introduce the rule of law. When he came to power Vladimir Putin reversed the process. Russia today is a land ruled by Putin, not by law. Putin is an autocrat, admired by aspirational demagogues such as Donald Trump and Nigel Farage. Needless to say the ineffably gormless Farage has led the assault on the rule of law, insulting the judges, calling for street protests, and bizarrely saying the judges’ rejection of the government’s case caused him to doubt their independence. Farage, the Mail and the Express are not Nazis, but they have scant regard for, or even understanding of, the forces they could unleash. Once the rule of law is undermined we will not be ruled by the consensus of sensible chaps discussing politics over a gin and tonic at the golf club. We will be subject to the vagaries and rages of the mob, which can be manipulated by an autocratic leader. That mob includes violent extremists who have picked up the message from the right wing press and UKIP politicians that their views are no longer peripheral, but are now mainstream. Farage is so lacking in sensitivity and awareness that little more than a week after the MP Jo Cox was murdered by a gunman, who called her a traitor, he could crow, during a referendum victory speech, that Brexit was a victory for decent people who had won “without a bullet being fired”. What, meanwhile, has the UK government done to shore up the rule of law, and the independence of the judicial system? Liz Truss, the Secretary of State for Justice and Lord Chancellor, has merely issued a bland defence of the principle of independence, without commenting on the campaign of intimidation. The Prime Minister has defended the press despite its appalling behaviour and government ministers have been queueing up to attack the High Court. The rule of law and an independent judiciary protects us from violent mobs and from arbitrary state power. When the Daily Mail and Nigel Farage use language like “enemies of the people”, and argue that “the will of the people” should take precedence over the law we should reflect on history. We should remember Gesundes Volksempfinden, the healthy feeling of the people, and we should shudder. This entry was posted in politics and tagged Alexander Yakovlev, Article 50, Brexit, Conservatives, Daily Express, Daily Mail, Daily Telegraph, democracy, Donald Trump, EU, EU referendum, gesundes Volksempfinden, healthy will of the people, Illustrierte Beobachter, Liz Truss, Lord Denning, Mikhail Gorbachev, Nigel Farage, Oswald Mosley, Parliament, rule of law, Sajid Javid, the will of the people, Theresa May, Tories, Vladimmir Putin. Bookmark the permalink. Well researched and written article. Upsetting in its validity. Thank you. Very clear and calm analysis of this phenomenon in Germany and UK but also in Russia. An excellent piece – thank you. One of those articles that had me thinking “cor – I wish I had written that” I wonder what Lord Rothermere would think of this article. I apologise for neglecting the comments. Thank you very much for your support. Feel free to quote, share or even just copy the article. It’s not as if I get paid for this, and I’m more concerned about getting the message out than about plagiarism. Obviously that waiver doesn’t apply to anyone who writes commercially!